We're getting ready for Shocktober Fest 2013, are you? In October, those brave enough to venture 'down on the farm' will be met with the sound of blood curdling cries, screams of terror and flowing tears of fright. Certainly not the serene and rural location one would generally associate with a farm but more the location for a terrifying Scream Park. The UK's No.1 Halloween Scream Park perhaps...? 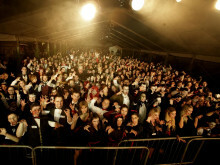 Winners of seven 'Screamie' Awards and the enviable accolade of the UK's No.1 Halloween event, Shocktober Fest at Tulleys Farm continues to get bigger and better every year. With 18 'fright nights' in October and November, each offers shocks, scares and thrills in abundance. Six award winning haunts are in the midst of construction, guaranteed to take each visitor on a journey of pure terror. This morning, a steady stream of lorry's are arriving, carrying huge steel containers that will help to create the many sets used for the haunted houses. Shown in the photo is the start of the build for the WoodShock Live Music stage, a stage that will soon be playing host to legendary band 'The Animals & Friends', on the festivals' opening night on the 5th. 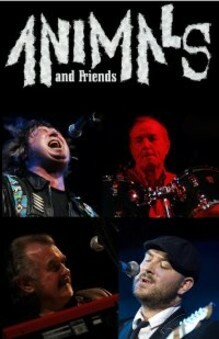 Joining the line-up which includes The Troggs, Doctor and The Medics & The Lambrettas, the live music is an exciting addition to this year's festival flavour. 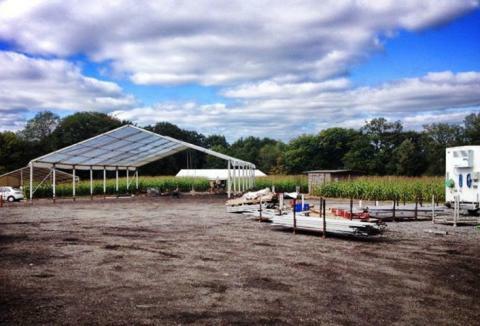 In a few weeks it'll be the arrival of a fabulous circus top in the cornfield, ready to house 'Cirque de Shock', a shocking circus that will entertain with daredevil stunts, acrobatics and dangerous acts. With the opening night just 12 days away now, the site is in the midst of transformation, ready to welcome hordes of excited families, friends, groups, clubs and terror enthusiasts. Now with many purchasing tickets in advance, making good use of the easy online booking facility, it's no surprise that some of the Scream Park passes have already sold out! So the question is, we're getting ready for Shocktober Fest 2013, are you? The Scream Park were delighted to welcome guests Jack Maynard & Elana Di Troya on Thursday evening, as they filmed a special Halloween edition of their online TV show. 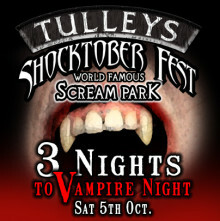 Tulleys' Vampires Stake Claim on New UK Record! In a sea of black capes, red dresses and fanged teeth, vampires from across the UK swooped in to the Shocktober Fest Halloween festival at Tulleys Farm near Crawley, Sussex on Saturday 5th October, to set a new UK record for the biggest gathering of vampires, but have missed out on breaking the world record. In the business of scaring people? 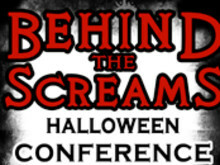 Screams Halloween Attractions will be holding their hotly anticipated conference, 'Behind the Screams', on Friday 11th October 2013.